This coming week we will read extensively from the story of the last week of Jesus’ earthly life as told in the Gospel of Luke. Previously we heard Jesus express his great sorrow over the rejection he would receive in Jerusalem, comparing himself to a mother hen rejected by her brood who she longs to gather under her wings. Now, immediately following his triumphal entry in which the large throng of disciples “praised God with a loud voice” he openly weeps over the city. 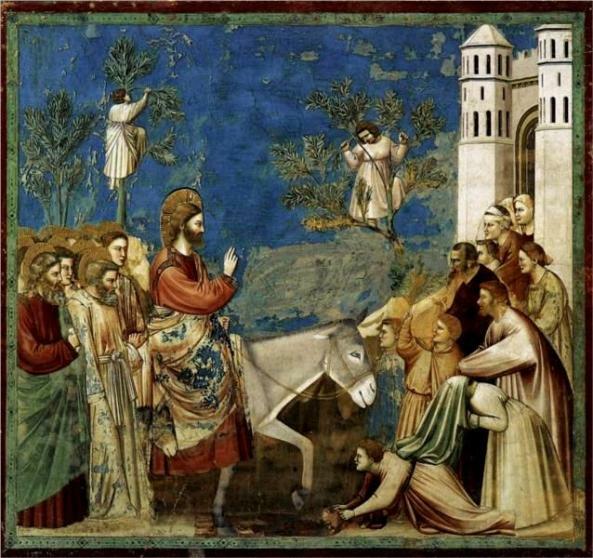 Jesus comes riding on a donkey as the prince of peace. But the powerbrokers in Jerusalem, both Jewish and Roman will not embrace “the things that make for peace.” Because of their hard heartedness, the day will come 37 years later in 70 AD when a foolish violent rebellion against Rome will result in a siege of the city that will end with the Temple and everything else in the city reduced to rubble. Jesus goes directly to the Temple where he drives out those who were selling the blemish-free animals, that pilgrims were required to purchase to offer to the priests, as a sacrifice to atone for their sins. For a single day, he disrupts the oppressive system that profits, from the heavy burdens placed on the backs of poor pilgrims, who have made the long journey to the Holy City seeking peace with God. Unlike Mark and Matthew who speak of Jesus “overturning tables”, and John who places in Jesus’ hand a “whip of chords”, Luke seems intent on emphasizing the non-violent nature of this action. It is a symbolic act of resistance. Though his action may have been misinterpreted, Jesus’ intention is not to strike the first blow of the violent revolution that many had hoped for. Nonetheless, with this action Jesus has made it clear that he is a threat to the power system. Normally Jerusalem was a city of 40,000 residents. When all the pilgrims arrived at the city for the Festival of Passover, the population would swell to half a million. Passover celebrates the story of the Jewish peoples’ liberation from the oppression of Pharaoh in Egypt, and as such it would have been a time ripe with patriotic fervor and resentment towards the Roman overlords. The authorities had reason to be anxious. They begin “looking for a way to kill” Jesus. But the multitudes of people find him captivating, and “get up early in the morning to listen to him” (Luke 21:38). Consequently, the religious authorities cannot simply have him arrested lest the people rise up against them.